Pop singer and pianoist Angela Aki (30, Japanese/Italian-American) has just released her 2nd major Album (3rd – including her first U.S. Indie), “TODAY” in Japan today. 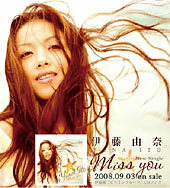 The album features “Again”, which was the theme song for Mezamashi TV from April 2, 2007 onwards. The album is released in two different versions – a limited edition CD+DVD and a CD only version.